Graphic Novel and Comic Art Scholar N. C. Christopher Couch Will Be a Speaker at LIPopCon 2015! N. C. Christopher Couch holds a Ph.D. in art history from Columbia University and is a professor at the University of Massachusetts Amherst. He is the author of numerous books and articles on Latin American art and on graphic novels and comic art, including The Will Eisner Companion: The Pioneering Spirit of the Father of the Graphic Novel (with Stephen Weiner), Will Eisner: A Retrospective (with Peter Myer), Faces of Eternity: Masks of the Pre-Columbian Americas, and The Festival Cycle of the Aztec Codex Borbonicus. He curated exhibitions at the W.E.B. Du Bois Library American Museum of Natural History, the Americas Society, the Oklahoma Air and Space Museum and the Smith College Museum of Art. He was senior editor at Kitchen Sink Press (Northampton), editor in chief at CPM Manga (New York), and has taught at Amherst, Columbia, Hampshire, Haverford, Smith and Mount Holyoke Colleges, and the School of Visual Arts. Publications he edited won or were nominated for 17 Eisner and Harvey Awards, and he has held fellowships at the Institute for Advanced Study, Dumbarton Oaks of Harvard University, and the Newberry Library. 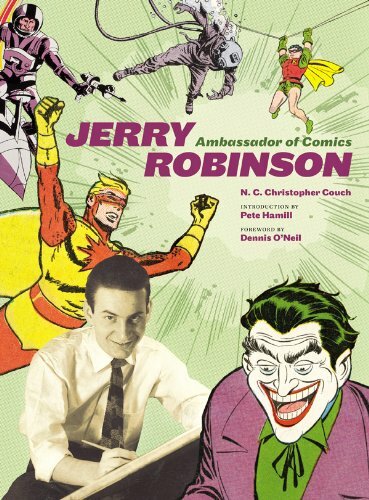 Current publications include the edited volume Conversations with Harvey Kurtzman, and a book on Batman artist and editorial cartoonist Jerry Robinson called Jerry Robinson: Ambassador of Comics. To learn more about N. C. Christopher Couch, please visit http://www.umass.edu/complit/people_fac.shtml#couch. To view N. C. Christopher Couch’s Amazon page, please visit: http://www.amazon.com/N.-C.-Christopher-Couch/e/B001K8SJ9K/ref=dp_byline_cont_book_1.